The results are unambiguous: voters want more government investment and higher taxes on the wealthy. On the top line, it’s pretty simple: Barack Obama ran on an unambigious platform of government investment, higher taxes on the wealthy and a protected safety net. Mitt Romney ran on an equally clear platform of vastly decreased federal spending, including on “entitlement” programs, and lower taxes for everyone (and, though he frequently denied it, mostly the wealthy). Now, the political conversation turns immediately to the fiscal cliff, which requires big decisions on tax rates and government spending. Obama’s re-election should be a clear enough sign of how voters want this handled, but of course there are hitches: pundits and politicians can invent all sorts of other reasons why Obama was re-elected, and on several occasions during the campaign Obama voiced support for the Simpson-Bowles deficit reduction plan, which would lower rates in all income brackets and cut the safety net. So it’s therefore important to make clear that voters quite consciously chose a different path. The polling data bears that out. A survey of people who voted in the past election, for both candidates (sample size 1,000; plus or minus 3.1 percent) conducted by Greenberg Quinlan Rosner Research for Democracy Corps and the Campaign for America’s Future found that many individual elements of the Simpson-Bowles plan are deeply unpopular with the electorate. 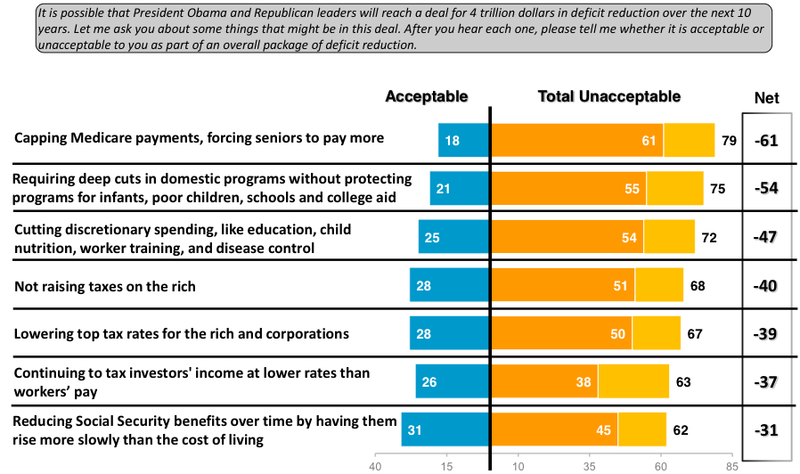 These things are not just unpopular, but unacceptable among voters by wide margins. Let’s look also at a few key Senate races where these issues played out. As the Center for American Progress’s Tom Periello lays out in a memo today, the issue of tax fairness was central to multiple races in purple or even red states—and Democrats prevailed. In Wisconsin, Representative Tammy Baldwin not only supported the Buffet Rule, but she was the lead sponsor of a bill to enact it in the House of Representatives. Her opponent, Tommy Thompson, opposed the Buffet Rule as discriminatory, and as Periello’s memo notes, the US Chamber of Commerce and Karl Rove’s Crossroads groups spent $3.6 million over the final two months of the campaign to attack Baldwin as a tax-and-spend liberal. She won the race 51-46, and a near-mirror image number of Wisconsin voters said taxes should be raised on those making $250,000 or more. North Dakota presents and even more interesting case study—illustrating that even some voters who chose Mitt Romney may have done so for reasons other than his approach to taxes and government spending. The state went for Romney 58-38, but Democrat Heidi Heitkamp narrowly won the Senate race over Republican Representative Rick Berg. Heitkamp championed tax fairness and the Buffet Rule, and attacked Berg repeatedly over his vote to cut taxes on the wealthy. Republican outside groups spent half a million dollars in the final eight weeks against Heitkamp to define her as a tax-raiser—and yet, she prevailed. The lessons of this election are clear: voters want higher taxes on the wealthy, and for the government to invest in the economy, not reduce spending. Politicians of both parties should keep this in mind. On Tuesday, voters opted for collectivism over the GOP’s “you’re own your own” society. Check out Katha Pollitt’s take here.